NEWS The month in resource management Systems and software AMCS Group links up with Exertis I'M HONOURED TO RECEIVE THIS AWARD - The co-founder of container awarded an MBE in the New Year Honours List 2015. Elston, who set up the 'dedicated services to manufacturing'. Speaking about her achievement, Elston response I have received since being given an MBE – I still can't quite believe it." 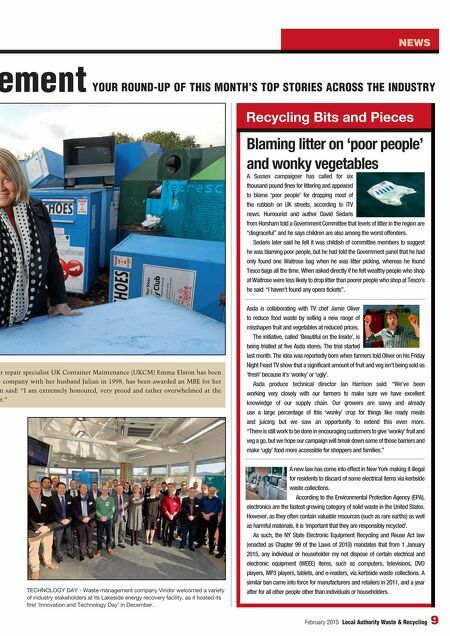 8 Local Authority Waste & Recycling February 2015 A Mexican-based firm called Ak Inovex is claiming it can recycle plastics without water through a new process that reduces production costs by half. In a statement on the Cleantechchallenge website, Ak Inovex said that its process did not require liquids and could handle a variety of types of plastics. According to AK Inovek founder Marco Adame, the process can be used on 90% of plastics, avoids water use and Plastics recycling Recycling 'plastics without water' AMCS Group, a ERP software and vehicle technology specialist for the waste, recycling and resource industry, has announced the appointment of Exertis, a leading technology distributor and supply chain business, as its global supply chain partner. In line with AMCS Group's expansion strategy, Exertis will manage the Group's rapidly growing international global supply chain. Under the terms of the agreement, Exertis, which is part of the DCC Group, will assume responsibility for the global delivery of all AMCS Group's vehicle technology systems, pre assembled and ready for installation. Exertis was chosen by AMCS Group for its global resources, proven expertise in configuration, logistics, distribution and experience in managing the international supply chain for many well-respected brands. Wincanton is currently trialling new vehicle safety technology to protect vulnerable road users and prevent damage to their new shredding vehicle operated by Wincanton Records Management (WRM). Brigade's Backeye 360 Select was fitted to the 18-tonne vehicle to allow the driver to see a 'bird's- eye' view, eliminating blind spots and reducing collisions. WRM national transport manager Bob Chambers said: "The innovative system allows the driver of the vehicle to literally see any obstruc- tions or vulnerable road users any- where around the vehicle. "As we build up the shred mobile business in and around the City of London, this piece of safety hardware will prove invaluable in keeping a safe interface between our vehicle and vulnerable road users." 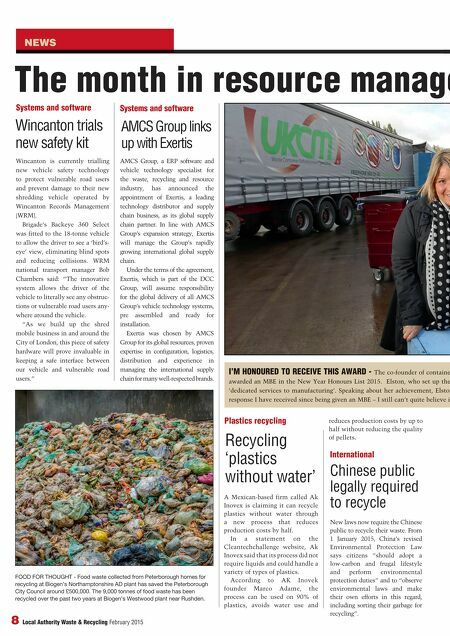 Systems and software Wincanton trials new safety kit New laws now require the Chinese public to recycle their waste. From 1 January 2015, China's revised Environmental Protection Law says citizens "should adopt a low-carbon and frugal lifestyle and perform environmental protection duties" and to "observe environmental laws and make their own efforts in this regard, including sorting their garbage for recycling". Chinese public legally required to recycle International FOOD FOR THOUGHT - Food waste collected from Peterborough homes for recycling at Biogen's Northamptonshire AD plant has saved the Peterborough City Council around £500,000. The 9,000 tonnes of food waste has been recycled over the past two years at Biogen's Westwood plant near Rushden. reduces production costs by up to half without reducing the quality of pellets. The month in resource management I'M HONOURED TO RECEIVE THIS AWARD - The co-founder of container awarded an MBE in the New Year Honours List 2015. Elston, who set up the 'dedicated services to manufacturing'. Speaking about her achievement, Elston response I have received since being given an MBE – I still can't quite believe it."